and a vacuum press works? According to the laws of physics, a bumblebee cannot fly. However, the bumblebee does not know that and flies nonetheless. The same is true for a bonding technique that still unsettles some wood processors but has been used for a long time by many of them: vacuum bonding. Originally developed to realize shape bonding without counter-template, vacuum presses are increasingly used for veneering and coating with HPL and many other laminates. But how does it work? How can a thin natural rubber membrane apply sufficient pressure to ensure a perfect bonding result? At this point, physics comes into play. The pressure is not applied by the membrane, but it is only the pressure of the atmosphere that is applied. And the more air is evacuated from the closed space under the membrane, i.e. the greater is the difference between the ambient pressure and the pressure under the membrane, the more the atmosphere applies pressure on the workpiece. Similar to diving, the pressure increases the lower you are below the water surface. We are at the bottom of a huge sea of air and use the air column in vacuum technology, which applies a pressure of 10 tons per m² to the workpiece at a vacuum of 98% (which is achieved by an oil lubricated vacuum pump). This immense pressure is exactly the same on every square centimeter – this is why differences in panel material, veneer or laminate no longer play a role during application of the glue. In addition to uniform pressure, the high vacuum offers another advantage that makes the technology economically very interesting: in a vacuum, the boiling temperature of water is lowered, greatly reducing the bonding times when using white glue. E.g. a vacuum press with oil-lubricated vacuum pump ensures almost the same bonding times as a heated veneer press. But with the big difference that for this purpose no hot plates with a power of 15 kW or more are necessary, but only 120 – 150 watts are needed. As the vacuum press does not apply any mechanical pressure to the workpiece, it does not matter whether there are dust particles on the panel, a small chip of wood, adhesive tape for fixing or glue residues on the membrane, even with sensitive surfaces (such as high-gloss HPL). Due to the physical properties of the identical pressure at each point, there are definitely no marks. However, this only applies to the top of the workpiece. On the bottom side, you have to work as carefully as with a normal veneer press. Versatility is arguably the feature that the users of vacuum presses appreciate the most. 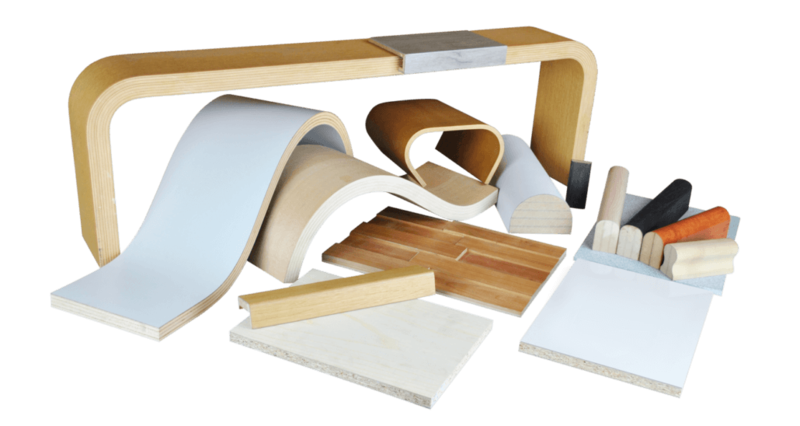 In addition to the previously mentioned shape and surface bonding, vacuum technology does a great job when it comes to wrapping, edge bonding such as bonding paneling with waste wood or split wood. Additional options are limited only by your own creativity. And sometimes physics (think of the bumblebee!). The benefits are obvious and more and more users are taking advantage of this machine, which has become an integral part of operations after a short time. As creativity is standard in woodworking companies. There are many ways to create negative pressure. In general, two factors play a role. It indicates the suction volume of a pump within a certain period of time. The BARTH-VPW and VPS series is optionally equipped with a 25 m³/h pump. Larger sized pumps of 40 or 63 m³/h are also available. For the BARTH-VP series, we use 16 and 25 m³/h pumps. It describes the maximum negative pressure that the pump can reach. 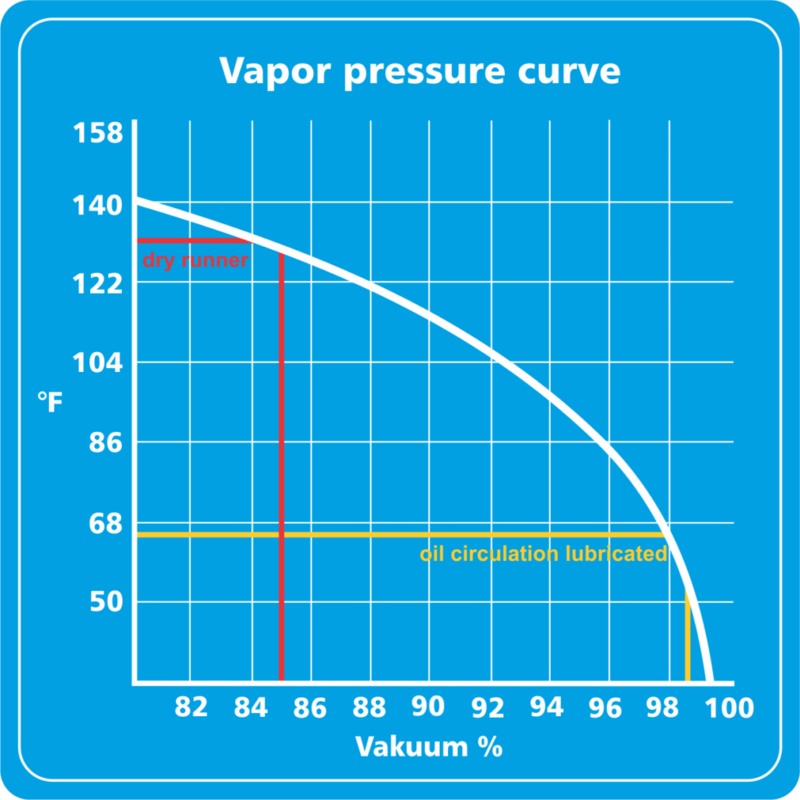 These values are given in % or mbar final pressure. The purpose of the Vacuum pumps of the BARTH series reach a final pressure of 98 % or 20 mbar. This means that 20 mbar of the standard air pressure (1013 mbar) remain in the system. This corresponds to a pressing force of 9.9 t/m². For economic use in vacuum presses, only one type of system can be considered. These are the rotary vane pumps. These in turn are divided into two different types. As the name suggests, these simple and affordable pumps run dry and lubricate themselves by abrasion of their pump vanes. Of course, this also implies the corresponding wear. The biggest disadvantage of these systems, however, is the attainable negative pressures of commercially available pumps. These are at a vacuum of 80 – 85%. In principle, the design of these pumps is similar to dry-running systems. However, they have a loss-free oil circulation system. The sucked oil lubricates and seals the pump. A filter cartridge “captures” the oil blown out with the exhaust air and returns it to the circuit. Due to this system, these pumps run almost wear-free. However, the main advantage for their use in vacuum presses is the achievable negative pressure of 98% or even 99.5% vacuum. In the BARTH vacuum press series, we have been using pumps lubricated with circulating oil since the first machine. Some of these machines have been running trouble-free in 3-shift operation for 15 years now. Another advantage of this pump is that it runs extremely quietly. But the main reason for using this technology is the ability of vacuum to lower the boiling point of liquids! With a vacuum of 80%, water “boils” at about 60°C. At a negative pressure of 97%, the boiling point drops to 24°C. So, the pressing time is halved compared to 80% vacuum, when using commercially available white glues. The membrane should be put with the least possible effort and without creasing onto the workpiece to be processed. The force required for elongating is deducted from the pressing force to be generated. This takes especially effect on vertical workpiece surfaces (edge ​​bonding) or undercut parts. The elongation at break (600, 750 or 800%) which is often specified as a measure is not suitable as a quality indicator for a membrane as it is usually not reached in use. A major factor for the application and longevity of a membrane is the recovery of the original form after elongation. 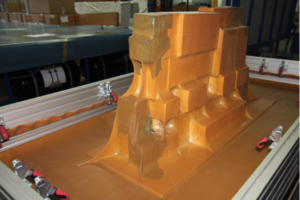 Dented and warped membranes easily form wrinkles and move workpieces on the templates. Undisputed leader in this “discipline” to this day is natural rubber. Its recovery values ​​cannot be achieved with any technical elastomer. However, this advantage must be “bought” by the UV sensitivity. This means that UV radiation leads to aging and embrittlement of natural rubbers. The service life of the membrane is drastically increased if it is covered. It provides information about how easy sharp edges and corners penetrate into the material and cause it to break in elongated condition. The natural rubber Naturkautschuk–mixture used in BARTH vacuum presses with a thickness of 2 mm is the best compromise between elongation and recovery capability and tear resistance. In the test, this membrane returned again and again to the original length after 4 million elongations of 400%. In practice, up to 250,000 mouldings of 400 mm height are pressed with one membrane. The inherently translucent membrane becomes more transparent, the more it is elongated. On one hand, this serves as an indicator for the elongation, on the other hand it provides a view of the clamped workpiece. It is usually not necessary to clean the membrane. When using white glue, the glue adhering to the membrane comes off the membrane after drying and falls off. Glue residues adhering to the membrane create marks on the workpieces! When using PU – glues, it is advisable to put a plastic sheet on the workpiece in order to avoid widespread contaminations due to the foaming of the glue. The membranes are bolted to a special clamping profile in the machine top frame. This ensures a secure mounting of the membrane, even with high elongations.